Izzi Tooinsky, The Wild Man, is a unique vaudevillian entertainer who has been performing at fairs, festivals, schools, and museums since the dawn of time. 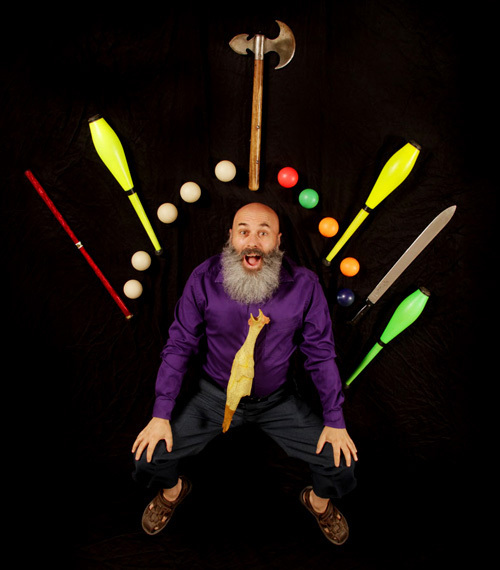 The Wild Man is a juggler, clown, comedian, storyteller, and educator. He is the author of two books, creator of 7 storytelling CD’s, father of two wild women and has performed in 17 countries around the world. But all of the above agree that The Amazing Little Old Man’s performance is bold and creative, flamboyant and fun for people of all ages. His quick mix of comedy, juggling and audience participation makes him a favorite everywhere from The International Children’s Festival in Wales to the wild desert extravaganza of Burning Man.